Picking a story from a former MD of MAS, now I know why it is in trouble. KUALA LUMPUR: Former Malaysian Airline System (MAS) managing director, Tan Sri Abdul Aziz Abdul Rahman, has suggested that the ailing carrier acquire profit-making AirAsia as a strategy to resolve its financial woes and return to profitability. 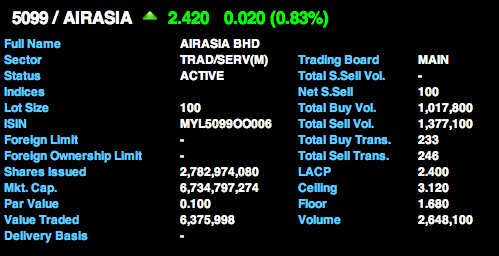 "(There is) no need for a merger with AirAsia X. MAS is the one that should buy over AirAsia and make it a subsidiary. MAS as the national carrier should lead, rather than the other way round. "MAS just needs to be managed properly based on market demand," he said. Abdul Aziz also suggested that the national carrier, 69% owned by Khazanah Nasional Bhd, be delisted from the stock market. "As far as the airline is concerned, this is not going to make any difference. Delisting will make the management's job easier, as there is no need to follow procedures as set by the exchange. 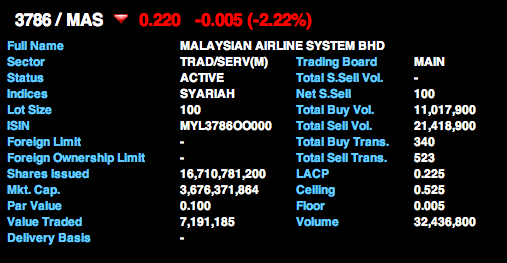 But those who bought MAS shares at RM3 or RM5 would be unhappy," he said. The former MD said the acquisition would enable the combined group to focus on the low-cost fare market that comprises 80% of the South-East Asia market, as well as the competitive premium market, which is a far better proposition than competing against each other. Proposals and suggestions to save MAS have gained greater traction following net losses in the first quarter ended March 31, 2014 which widened to RM443.39mil from RM278.83 million a year ago. The airline put in place a turnaround plan recently but it has been scuppered by the missing MH370 plane incident in March, and things have worsen with the shooting-down of Flight MH17 in eastern Ukraine last week. There is no strong political will to revamp MAS. My best guess is another bail out again. Next after 2-3 years, another bail out. It just won't stop. All these so called restructuring, revamping, etc are just for a show. And wasting all our hard earned money instead for nation building for the benefit of all but used for feeding ... This is what sets M & S apart in terms of building the nation from a business point of view ... and the results show. Is Jobstreet underpriced by Seek? CSL: Can you trust its cash holdings? What happens to Keuro's rights?